Mostly cloudy. Slight chance of a rain shower. High 77F. Winds SE at 10 to 15 mph..
Thunderstorms likely. Low 51F. Winds NE at 10 to 15 mph. Chance of rain 80%. SERGEANT BLUFF | Alex Borchers had a 16-6 lead over Sergeant Bluff-Luton after one quarter, then his South Sioux City teammates chipped in for a 66-60 boys basketball triumph here Thursday night. Borchers, a 5-11 senior, got off to a start most players could only dream of, scoring all of his team’s points in the first quarter. He wound up with 28, leading the Cardinals to their fifth straight victory. South Sioux City closed the regular season with a 15-8 record and won’t start Class A district play until Saturday, Feb. 28. Aspen LaPointe chipped in 16 points, making three straight three-pointers in the fourth quarter after Sergeant Bluff-Luton trimmed a 13-point deficit to three. Borchers made six of seven shots and three free throws in the first quarter. The Cardinal point guard converted three conventional three-point plays and also canned one from beyond the arc in the first eight minutes. “I think he (Borchers) was feeling it with the start he got off to,” South Sioux City Coach Terry Comstock said. “I looked up at one time and I think he was leading 16-9. We knew we had to get other guys involved because obviously that wasn’t going to last the whole game. The first South Sioux City points not scored by Borchers came with 2:33 left in the half on a basket by Reuben Snake. SB-L, however, cut the deficit to 26-21 at halftime. South Sioux City got off to a fast start in the third quarter, outscoring the Warriors 12-4 the first four minutes. A three-point play by Tanner Christensen gave the Cardinals their biggest lead, 38-25. Momentum, though, shifted back to Sergeant Bluff-Luton in the final four minutes of the third quarter and first two of the fourth. The Warriors came within 40-35 before Kaleb Comstock took a feed from Borchers and scored with 5.3 seconds left in the third. A putback by Jackson Wright pulled SB-L within 44-41 with 5:59 remaining, but LaPointe sandwiched two threes around a Christensen basket and then made another shot from long range. His third trey made it 55-47 and after the hosts got a bucket and two free throws from Chris Kroll, South Sioux City made 10 free throws in the final 1 minute, 32 seconds. Kroll, an outstanding sophomore guard, paced Sergeant Bluff-Luton with 18 points. Jacob Shultz added 11 points while Andrew Christensen and Wright contributed 10 points apiece. The Warriors, who finished the regular season 11-10, play Sioux City Bishop Heelan in a Class 3A district opener Monday at 6:30 p.m. at Le Mars. Alex Borchers 8-12 11-16 28, Aspen LaPointe 5-11 3-5 16, Kaleb Comstock 2-3 0-1 4, Jake Schmiedt 2-10 0-0 5, Tanner Christensen 2-5 1-1 5, Paul Tindall 0-0 1-2 1, Reuben Snake 2-2 0-0 5, Silas Brown 1-2 0-0 2, Casey Bright 0-0 0-0 0. Totals 22-45 16-25 66. Chris Kroll 6-13 5-6 18, Connor Prescott 1-4 0-2 3, Jacob Shultz 2-8 6-7 11, Andrew Christensen 4-4 2-3 10, Keegan Savary 3-8 0-0 6, Jackson Wright 5-6 0-1 10, Brandon Huberty 0-0 0-0 0, Isaac Croston 1-1 0-0 2. Totals 22-44 13-19 60. 3-point shots – South Sioux City 6-18 (LaPointe 3-8, Schmiedt 1-6, Borchers 1-2, Snake 1-1, Brown 0-1), Sergeant Bluff-Luton 3-15 (Shultz 1-6, Kroll 1-5, Prescott 1-3, Savary 0-1). Fouled out – Savary. Rebounds – South Sioux City 23 (Snake 5), Sergeant Bluff-Luton 30 (Savary 8, Wright 8). 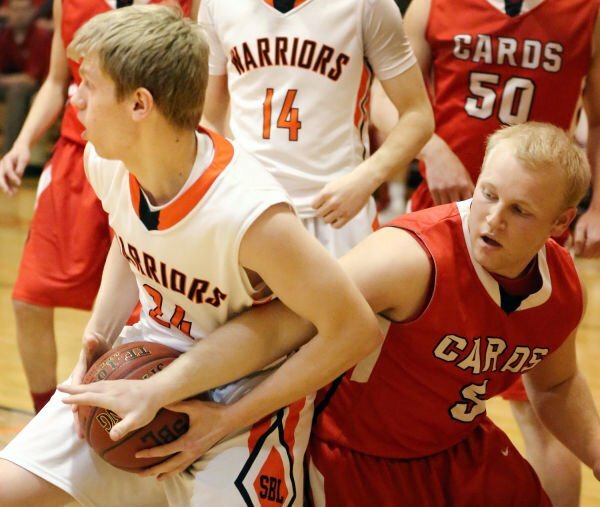 Turnovers – South Sioux City 7, Sergeant Bluff-Luton 11. 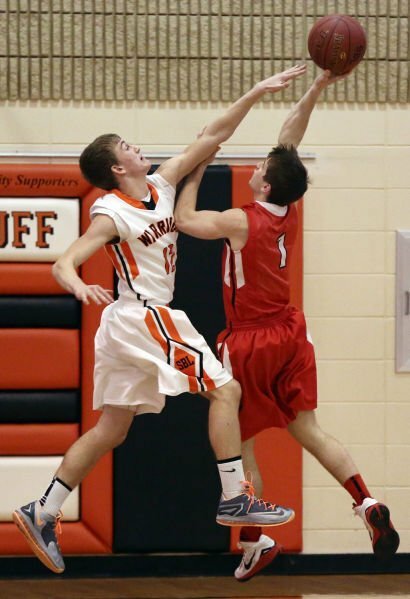 Total fouls – South Sioux City 19, Sergeant Bluff-Luton 21.